Summary: A series of lectures on the state of the Catholic Church that was later turned into a book. Over the past several months I have been reading about Catholicism (see below for other reviews). Many of the book have been written by Evangelicals that have converted to Catholicism. I chose several of them precisely because I knew that they would write with language that I as an Evangelical would mostly understand. But it is time to start reading more widely and I want to start reading more books written by Catholics to other Catholics. I picked this audiobook up on a whim from Audible because I had a couple dollars of promotional credit and it was on sale. It is not actually a book. It is a series of lectures that was later turned into a book. It is not new either. The lectures were given in 1985 during lent. It sounds like they were given in a church basement to a small group of people that are concerned about their church (although the audio of Rohr is very clear). On the whole this does not feel all that dated. There are a few things that let you know that these are almost 30 years old. But most of the issues are probably pretty similar. 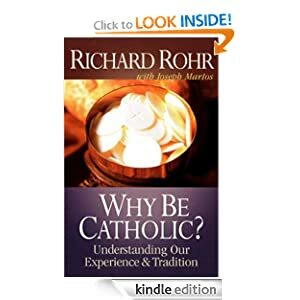 What I always find most encouraging is that many of the poor assumptions about Catholics that Evangelicals have disappear quickly when you actually listen to people like Rohr. This is a man that is in love with Christ, that wants to see the world evangelized that is charitable in his opinions of other Christians and has a real heart for the church. He opens each lecture with a prayer, prayers that would be very comfortable and familiar to Evangelicals. The four chapters/lectures are What is Great About Being a Catholic, What is the Shadow side of Catholicism How Can You Be Catholic in America Today and Who are Our Heroes and Heroines? The first chapter focuses on what it means to be Catholic. By this sometimes he means what it means to be Christian and sometimes he means Catholic as opposed to Protestant. The two things from this chapter that I found most interesting is that he see Catholics as more focused on communal activity instead of individualistic activity. The second thing is the very long view that being a part of the Catholic church gives you. As an Evangelical we frequently hear about how bad things are, or how quickly things change or how important that this particular thing is right now. Rohr says that as a Catholic he can point to 2000 years of history and that this gives him an enormous amount of hope that the Holy Spirit really is guiding the church and that we can’t move outside of God’s pervue. The last two chapters I thought were less important, although still interesting. The third chapter is a call to social engagement because it is a strength of a church that is united. The fourth chapter is a call to remember the history of the church and its saints that have gone on before. Again, useful, but less engaging, although probably very important if the concern really is how to raise up people to stay in the Catholic Church. I liked listening to the actual lectures instead of the book. People asked questions at the end of each lecture. Although not all of the questions were all that helpful and some were not at all audible, but it gave character to the meetings. The people that came were interested in their church. Rohr was interested in their spiritual state, and his own, right after this he went on a sabbatical and stepped away from parish ministry. The more I read about Catholicism, the more I think that Evangelicals are will be looking toward Rome as partner and less as adversary as cultural Christianity fades in the United States and as both churches become smaller, but stronger.